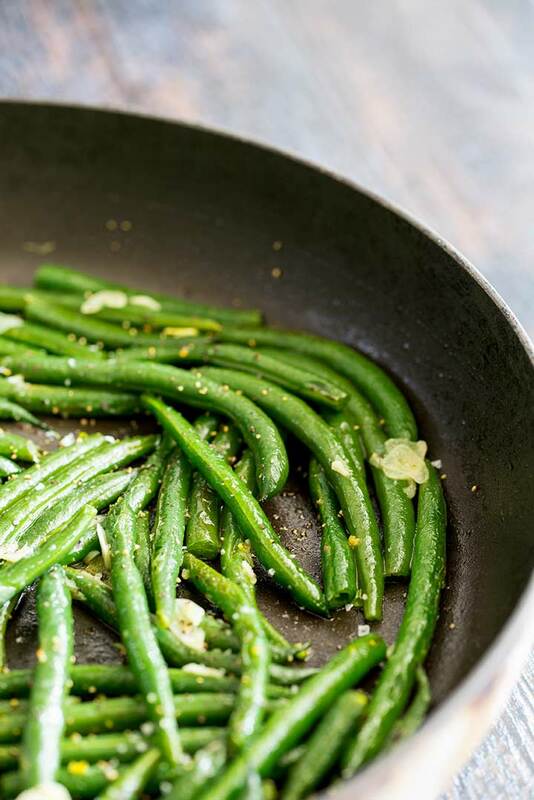 These Easy Skillet Garlic Green Beans are sautéed with garlic and olive oil, then steamed with a little vegetable broth, to make one of the most simple yet delicious side dishes. The beans come out tender-crisp, so they are super healthy and they take just 10 minutes to cook, making them an easy addition to your family table. Serve them with your weeknight meal, or add them to your holiday table. 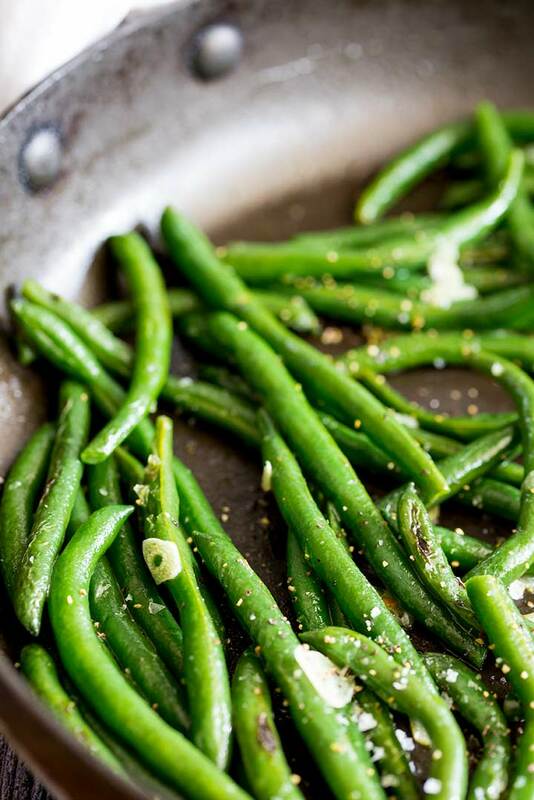 Green beans make a great easy side dish for so many meals! Plus because they cook so quickly they make a great last minute side option, you know for the evening when you almost have dinner ready and suddenly realize that you forgot the veg and your dinner is a little carb heavy. (Or the evenings when you know your dinner is carb heavy so you feel it is only right to add some token green to your plate!) I’m looking at you Garlic Chicken Pasta. 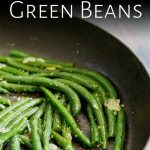 I don’t have many rules when it comes to cooking, I always want people to adapt recipes to suit their family, but I do have a green bean rule. They need to be cooked until they are tender-crisp. Tender-crisp is when a vegetable is cooked through, but still has a little bite to it. So they are tender enough that your teeth will sink into them, meaning you can enjoy them with other elements of your dinner, but crisp enough that they still snap when you chew them, meaning you get to enjoy some texture and the vegetables keep their structure. PLUS tender-crisp vegetables still have plenty of nutrients in them so they are better for us that vegetables that have been cooked longer. 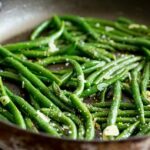 Why should green beans be cooked until tender-crisp? Tender-crisp green beans still have a wonderful green color. Overcooked beans start to turn a murky green and whilst they still taste good, they don’t taste AS good. Or look as good. Plus there is more chance of the kids eating them when they don’t look like canned beans! Undercooked the beans squeak as you eat them, I find that really awful to chew. The wonderful thing about cooking beans in the skillet is the little blistered areas on the surface. They are the beans to fight over! To do this get the oil nice and hot, then add the trimmed beans. Sauté them off for around 3 minutes until they are starting to catch in places. Add in the sliced garlic and then pour over the vegetable stock. Place on a lid and let the beans simmer and steam for 6 minutes. Remove the lid and evaporate off any remaining liquid. Season generously and serve. How to trim green beans. If you are using fresh beans you’ll need to trim the ends off. If you have them in a pre-sealed bag try shaking all the beans down into a row, then hold the beans and bag in one hand and use your knife to cut through the bag and beans in one go. It takes some practice but it is a very quick method! Alternatively, use kitchen shears to trim small bunches of them, this is faster and easier than trimming each one with a knife. 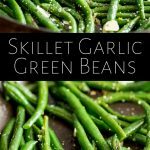 What can you serve with Easy Skillet Garlic Green Beans? 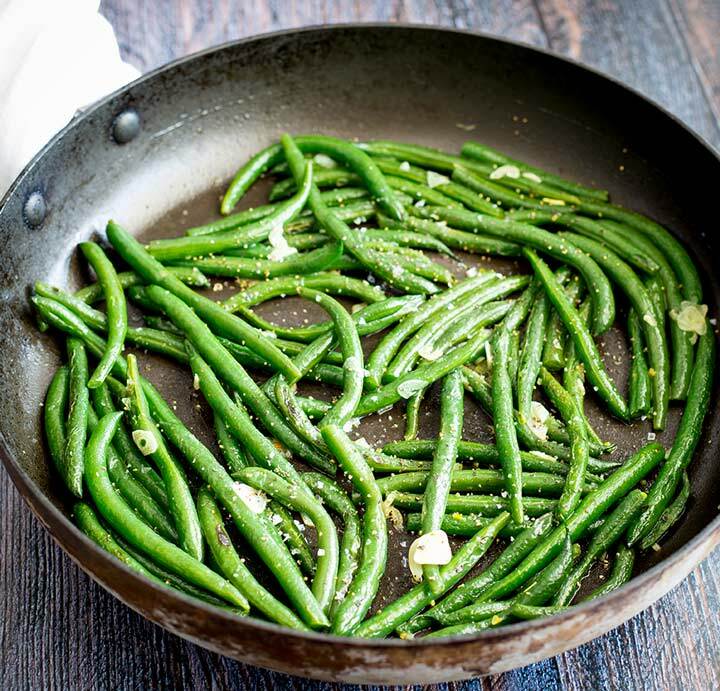 Pin this recipe for Easy Skillet Garlic Green Beans. Pin it here. 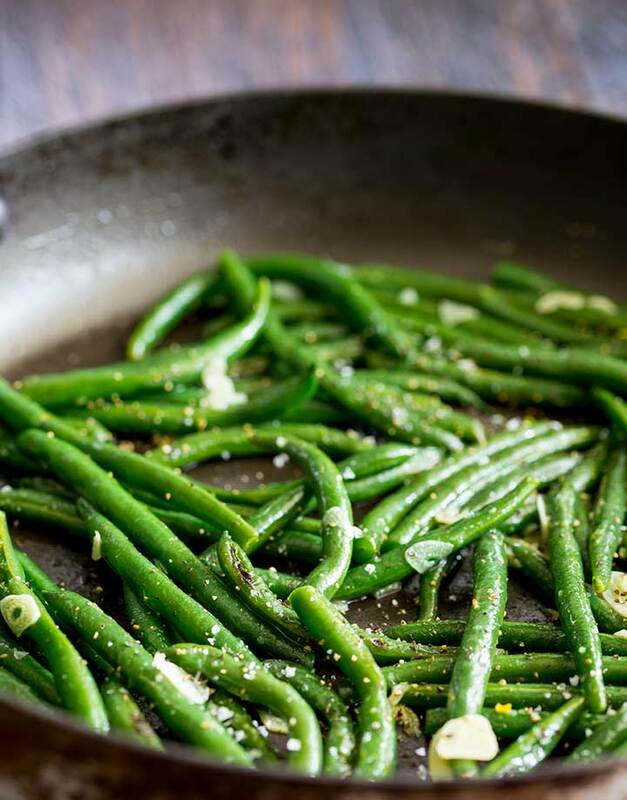 These Easy Skillet Garlic Green Beans are sautéed with garlic and olive oil and then steamed with a little vegetable broth, to make one of the most simple yet delicious side dishes. The beans come out tender-crisp, so they are super healthy and they take just 10 minutes to cook, making them an easy addition to your family table. Serve them with your weeknight meal, or add them to your holiday table. Place a large non-stick skillet over a medium-high heat and add in the olive oil. Once it starts to shimmer add in the trimmed green beans and cook for 4 minutes, stirring often, until the beans start to blister and char. Add in the sliced garlic then pour over and the vegetable stock. Season generously with salt and pepper then serve immediately. 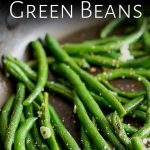 If you are using frozen green beans, sauté them for 4-5 minutes then use only 1/3 cup of vegetable broth and cook them for just 3 minutes.